There are many intriguing items on display at the Wonders of the Peak gallery, each with a fascinating story to tell about the people who lived in Derbyshire. One of them is a small beaver’s tooth amulet, kindly lent by the Trustees of the British Museum, which comes from a burial mound known as Wigber Low. The Anglo-Saxons arrived in Britain in the fifth to sixth century CE, a time that saw the collapse of the Roman Empire and Britain left to fend for itself – the first Brexit! The Germanic settlers who filled the power vacuum brought with them a new language, gods and artistic culture that defined the early medieval period. One of the ways that the Anglo-Saxons seem to have stamped their presence on the landscape was by burying their dead in older Bronze Age burial mounds, of which there are numerous examples in the Derbyshire landscape. One of these is Wigber Low, situated half way between Kniveton and Bradbourne, in the White Peak. The site originally started off in the early Bronze Age as a platform for the practice of excarnation where the dead were laid out for the flesh to rot away before the bones were gathered up and placed in communal tombs. In the Late Bronze Age a mound was placed over the platform forming a familiar burial mound that dot the landscape of Britain. In the seventh century CE the remains of three females and five males were placed in the mound, along with grave goods to accompany them into the afterlife. Items placed with the dead included a sword, five spearheads, combs, buckles, knives, a firesteel, a silver strap end, a quartz crystal orb, part of a gold bracteate (a type of pendant specific to Germanic people), two gilt-silver pins in the shape of a cross set with garnets (one of which is also on display at Buxton Museum and Art Gallery), and two beaver teeth amulets set with gold caps. Wigber Low means ‘Wicga’s Mound’ and it is possible that Wicga may have been one of the people buried here. The grave goods certainly indicate wealthy status for the people buried here, possibly the ‘eorlas,’ a warrior elite who lived in this part of the kingdom of Mercia. The beaver teeth amulets are intriguing – why would someone want to wear the teeth of an animal? The answer seems to be magical and the presence in the mound of the quartz crystal orb would suggest that one of the people buried here was a seer. Only six examples of beaver teeth amulets are known from Anglo-Saxon England and the presence of the gold cap clearly shows that it was an important and valuable item. There was a strong belief in magic at the time, and protecting yourself from malignant spirits that could cause harm was carried out by wearing amulets. In the animistic world of Anglo-Saxon Paganism many animals were considered sacred or imbued with special powers and It would seem that the beaver must have held some sort of special role in Anglo-Saxon society, but what, we do not know. Whatever its purpose the amulet was held in such high regard that it would be buried with its owner to accompany, and help them, in the afterlife. See the amulet alongside many other curiosities at Buxton Museum for free. Plan your visit here. Our relationship with viewing human remains on display in the modern museum remains a turbulent and divisive one. The controversy surrounding these exhibits has highlighted the ethical argument over how remains should be displayed, and whether they even should be. Modern museums are still struggling with the fine balance between education and entertainment, whilst trying to frame their exhibits in a manner which doesn’t compromise culture, respect and dignity towards the remains. Most modern museums are formed from private collections, like the establishment of the British Museum in 1753 from the collection of Sir Hans Sloane. With the growth of the museum due to donations, human remains were added along with the popularly collected Ancient Egyptian mummies during the ‘Egyptomania’ phase of the nineteenth century. Currently, the British Museum holds over 6000 human remains from all over the world dating back as recently to the early twentieth-century, to as far back as prehistory. Due to the huge time difference in the range of human remains, the Human Tissue Act of 2004 introduced new guidelines of how to display human remains and dictated that remains can only be displayed without the permission of kin if they are over 100 years old. For context, 100 years ago marked end of the First World War, which is easily in close memory of the older generation’s parents and grandparents. Buxton Museum currently has around fifteen examples of human remains on display. The displays include a complete skeleton, skulls, jaw bones, teeth embedded in a portion of cave floor taken from the famous Poole’s Cavern, cremated remains in a Bronze Age urn, and even a fake ‘mermaid’ with real human hair. The age of the remains can be dated from anywhere between 6,000 – 2,000 years ago due to the high level of prehistoric and Roman activity in the area. The only ‘modern’ exception is the ‘Mummified Mermaid’ who is a forgery estimated to be from the Victorian era. Because of the thousand years which stand between the remains and visitors in the museums up and down the country, the separation in time removes a lot of the humanity and empathy when viewing the displays. Even during the height of ‘Egyptomania’, there was still the separation of thousands of years between the ancient mummies and the Victorian public. But how and where do we draw the separation in time between us and the remains for them to be considered ‘objects’ and not ‘ancestors’? This is still unclear as shown by the Human Tissue Act and opens up new debates on whether 100 years is really long enough to justify the display of remains without the permission of any living relatives. However, museums are experimenting with ways that present the remains as more than just objects. Labelling and information cards are important to the narrative of the remains, but it is still easy to remain disconnected from this. Instead, technology in the museum space can be utilised to engage more intimately with the remains on a human level to aid in visitor interaction and also in provoking more empathy than before. Digital facial reconstruction has been used on two of the skeletons in Buxton museum from excavations at the local sites of the Iron Age mass grave at Fin Cop and the Neolithic burial at Liff’s Low. 3D printing further aids in the acceptability of viewing human remains. For example, a 3D print of the Fin Cop skull was made to be exhibited in Buxton Museum, as the full skeleton had been found, and to separate and display only the skull would have been inappropriate. Electronic tablets are also stationed around the museum to give visitors the ability to find out more about certain exhibits in depth and seeing them closer than just in the glass case. The tablets in Buxton Museum also provide the visitors with videos of how the digital reconstructions on the skulls were done, and in the case of the Fin Cop skull, an image of the real skull is shown without the need for it to be separated from the rest of the remains purely for the purposes of display. So whilst the words and the facts of traditional museum information cards help to pull the visitor in, they can feel like too clinical a way of presenting something so controversial. This is why technological advancements like digital facial reconstruction provide a respectful way of initiating empathy and re-humanising the remains to keep them from becoming just ‘exhibits’. Not only does it give a more familiar face for visitors to relate to, but it also helps in closing the thousands of year’s gap in time and space which divides the modern museum goer from the human remains. 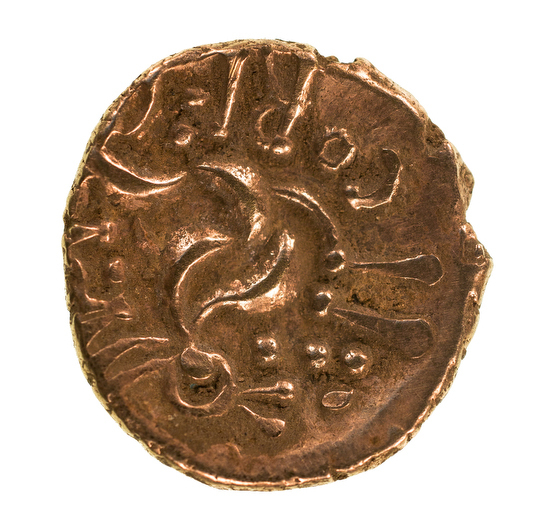 You may have already seen in the news that Buxton Museum now has the Reynard’s Kitchen Cave Coin Hoard on display so there has never been a better time to pay us a visit. In case you’ve missed all the excitement, the initial discovery of four coins was made by a member of the public, which led the National Trust to carry out a full excavation of the cave in Dovedale, a tourist hotspot on the border of Derbyshire and Staffordshire. In total, twenty six coins, including three Roman coins which pre-date the invasion of Britain in AD 43, were unearthed. 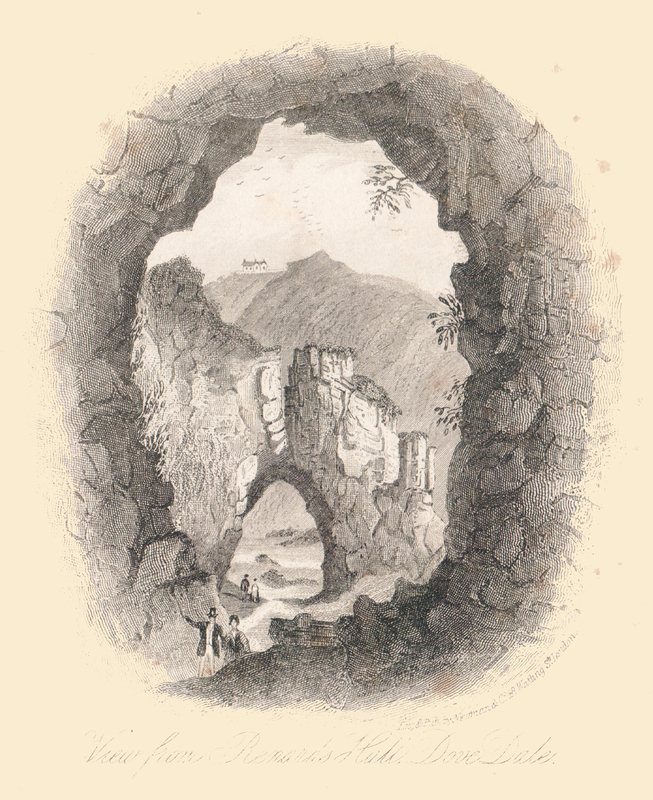 Reynard’s Kitchen Cave, Dovedale. Collection of Buxton Museum and Art Gallery. The hoard consists of both Late Iron Age and Republican Roman coins, the first time coins of these two origins are thought to have been found buried together in a cave in Britain. The discovery is significant. Not only is it unusual to find Late Iron Age gold coins, but to unearth them actually within a cave setting adds to the mystery surrounding them. Twenty of the coins are Late Iron Age and attributed to the Corieltavi tribe. These people lived further east of Dovedale in the modern Midlands. They were probably farmers, and came together for mutual benefit. Their tribal centres are thought to be Sleaford and Lincoln, and later in Roman times, Leicester. The excavation was led by University of Leicester Archaeology Service and undertaken by Operation Nightingale which provides recuperation for field archaeology to for service personnel injured in recent conflicts. The coins were then sent to be studied at the British Museum before being cleaned by conservators at the Institute of Archaeology at University College, London. 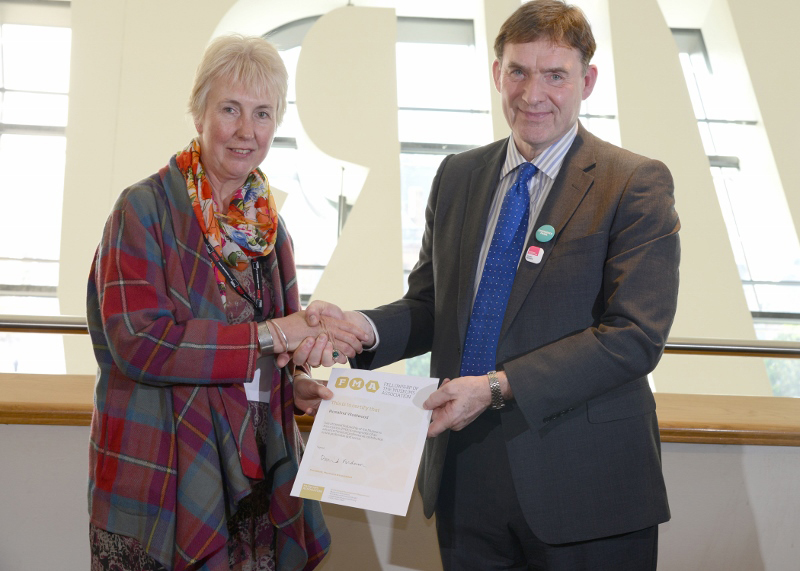 Another special mention this week to Derbyshire Museums Manager, Ros Westwood, who has been awarded Fellowship of the Museums Association from the President of the Museums Association, David Anderson at the recent Museums Association conference in Cardiff. Well done, Ros!